Freeriden is not only a sport but also a life-style for me. 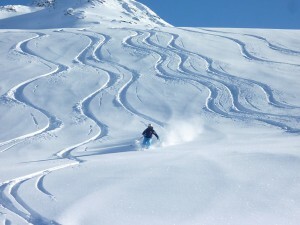 I always try to find the best runs, lines and powder. 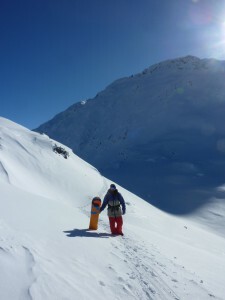 The most important for me is the security (avalanche gear is a must) and that everybody knows how to use it and how to react in case of emergency. Because every free-rider knows: the faster, the better the surviving chance. We don’t want to gamble but there are certain risks and danger in the mountains that can happen and that aren’t predictable. But don’t you worry, we will practice and train, professional free-riders and beginners. But there is also the other side when you put a lot of effort into the climb, until you reach the top of the mountain, but then, being able to take your planned line in the powder — you can’t describe this feeling, you have to experience it yourself. To have this feeling of freedom, to live the moment very intensively, to feel very strong but at the same time so little compared to the mountain. You only focus on the moment, the head is free and afterwards, if you had to put this stunning experience into words, you just feel the adrenaline, pride, and happy hormones. For me personally this is the best anti-stress training ever. We play with the nature: look for good lines, maybe with little jumps, adrenaline in the wonderful mountain world, awesome powder and fun in the sun.